Public Speaking is one of those skills that most of us wish we had. We are in awe of the orators of the world; of their presence on stage, how they stand there in the spotlight, how they can deliver such persuasive speeches. Although we wish we were capable of speaking in public, we rarely take steps to improve our ability until it is required of us. When looking for advice on public speaking, you’ll find a lot of people giving a lot of tips. One commonality stands out: practice. Practice is the one thing that all the experts seem to agree. Whether it is for overcoming a fear of public speaking or delivering a good presentation, practice is a key component. The biggest hurdle to good public speaking is that no one ever seems willing to practice public speaking. We’ve created a virtual reality tool, Virtual Orator, which I believe helps address some of the biggest issues surrounding practicing public speaking. It probably can’t solve a lack of motivation or a belief that you don’t have time, but most of these are excuses created to cover up the real issues stopping us from practicing. Lets suppose you are motivated to practice. How do you practice? Here are the standard tips on the web. They are all likely familiar. That we aren’t already doing these things indicates they aren’t ideal. For the majority of us, at least the 70% that reportedly fear public speaking, it all comes down to social pressures and the fear of rejection. There might be other reasons we believe drive our fear, but likely all of them come down to the psychology of social pressures. I’ll have posts specific to fear in the near future. If fear and limited opportunities are what keep us from becoming skilled in public speaking, or at least from the training that is necessary for us to achieve that feat, how can we overcome them? A virtual reality (VR) product like Virtual Orator can help. Lets look at the issues and how they play out in real life and using VR. How do we get an audience for practice? Persuade friends, family, and/or colleagues. Arrange a talk at your speaking club. Find actual speaking opportunities, e.g. social clubs Simply start it and don your HMD. Virtual audiences are always ready. maybe at a club if you have enough time Provides unique audiences every time you start. Audience always comes into your talk fresh. How do we find a large audience? When do we get practice? Family, friends, colleagues. often can be arranged spur of the moment. Groups larger than 3-5 can be a challenge to schedule. club: Generally scheduled well in advance and time slots unlikely to match your needs needs. Always ready and always can stay as long as you need. Elicits the same fear response? Depends on your audience and expected audience, but chances are it will be less here. You generally have an audience that doesn't want to hurt your feelings. It is also likely a smaller and/or less socially important crowd. VR audiences have been shown to elicit similar physiological responses as real audiences. Virtual audience can be the same size and behave similarly to how you expect your presentation to be. It is virtual so it may be easier to deal with. You can always practice with a harder audience. Where do we practice? Ideally, in the space we will present. More often our living room or some random meeting room. Physically we could be anywhere with a proper computer and HMD. Select a virtual venue that matches the physical venue where you'll be presenting. Currently, Virtual Orator has 6 unique venues with 12 layouts are available with more to come and custom environments possible. Does our audience respond realistically? Usually we have people who we know well and who want to be supportive. Reactions are probably not representative. Virtual audiences behavior patterns are selected to respond based on your needs. Can be a friendly, attentive group or a distracting, unruly bunch. Scales to your needs? Generally we're doing well to have audience at all. No scaling. Venue and audience sizes are configurable. Audience response is configurable. Start small and friendly, work up to distracted large audiences. What quality is the feedback you get? Family/Friends: depends. probably not expert feedback. tends to be overly nice. Colleagues: mixed. may include expert feedback. Tends to be nice. Club: mixed. expert feedback. Errs on the side of nice. Feedback still limited to things like eye contact patterns and slide timings. Speech content requires human feedback. Includes recording functionality for personal review or with another. Will they giggle, smirk, fall asleep, hate me, think less of me, saying bad things about me to others, etc.? Hopefully the person in the mirror will not. Speaking club: probably not, they appreciate what you are trying to learn definitely not (unless you configure them to be that way). They cannot talk to others. They won't even remember the next time you see them. Getting meaningful practice in real life can be challenging. Those challenge too often provides us with the excuse we need to avoid practicing our public speaking. VR and Virtual Orator make getting realistic practice as easy as putting on an HMD. The true benefit of VR is in the control of the situation. 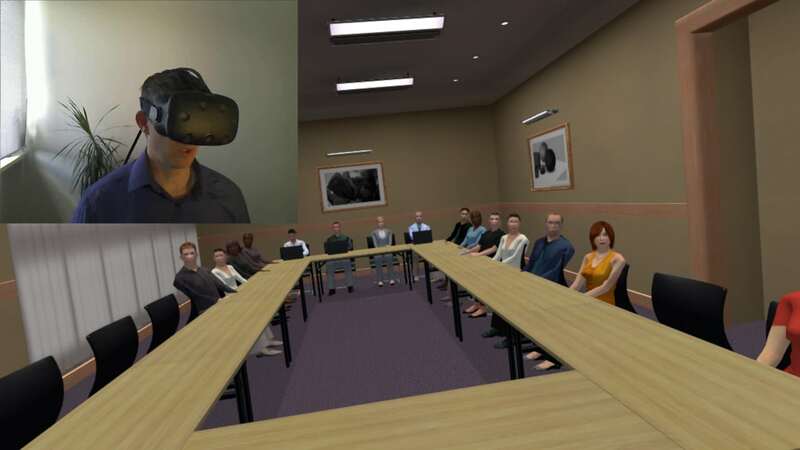 We can always get a situation that is right for us to train our public speaking in VR with Virtual Orator. Get Virtual Orator and start practicing today!